Singing about saving endangered species, protecting our water, and celebrating the wonders of nature, Joe Reilly's songs resonate with children of all ages, and remind everyone of the beauty that awaits us outside. 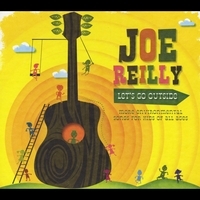 Inviting kids outdoors to explore nature, sing, dance, and play is at the heart of the new children’s CD by singer-songwriter Joe Reilly, titled Let’s Go Outside. The album of 18 fun and educational tunes begins with a “Wake Up” song to help kids and their families start their day smiling and singing. The album takes kids on an imaginative musical journey to examine natural science from the perspective of decomposers, water and a watershed, amphibians, and the strange scavenger raptor, the turkey vulture. In addition to these specific topics, Let’s Go Outside introduces young listeners to broad themes of living in balanced and sustainable ways, causes of and solutions to global climate change, the problem of endangered species, and what comprises a community. The album concludes by with a “Good Night” song, helping kids wind down after a long day of playing outside and bringing a sense of calm gratitude to little bodies and minds. Let’s Go Outside is a follow-up to Reilly’s 2007 release, Children of the Earth, which was featured on National Public Radio’s environmental program Living on Earth. Like his previous children’s album, Let’s Go Outside includes kid singers and songwriters accompanying Joe and his grown-up friends on many of the songs. Five of the songs were composed with elementary classrooms in the Ann Arbor Public Schools through a Michigan Education Association grant and the Ann Arbor Public Library Songsters Program. Other songs on the album were written with an elementary classroom in Detroit Public Schools, the Scholars Together Learning Community in Royal Oak, and campers at the Leslie Science and Nature Center in Ann Arbor. In addition to the children who sing with Joe, world-class musicians all contribute to the diverse musicality of the album, including Gayelynn McKinney (drum set), Marion Hayden (upright bass), Lori Fithian and Mark Stone (percussion), Mary Tillinghast and Lesley-Anne Stone (vocals), and Ryan Shea (guitar). The result is a creative collection of clever and engaging songs that make kids and parents alike want to get up and move like water, flap their wings like a turkey vulture, sound like the wind, decompose into compost, and jump like a frog. Included with the CD is a lyric booklet with suggested activities for each song. Living out the environmental values in his songs, Joe will donate a portion of the proceeds from sales of this CD to both the Huron River and Kalamazoo River Watershed Councils. Let’s Go Outside is an absolute delight. Don’t miss out on enjoying this album because you think kids are required for listening. Your day will be brightened rocking out to Joe’s educational, catchy and often hilarious lyrics. Those interested in working toward the betterment of society will be hearted by the way he uses examples from the natural world to inspire us to live from our true nature in harmony and unity with each other. This album showcases Joe’s wide range as an artist. I think you’re going to love it. And my bet is you’ll want to go outside and share this music with everyone you know. a fun, motivating, and uplifting album written with an environmental intelligence and musical charisma not found anywhere else. teachers and parents will like it as much as the kids. it's affecting, and really that's what we all need. This is a great new release from Joe Reilly. We love the interludes featuring real kids. The songs are catchy and fun, with a good message. This is definitely worth buying! Joe’s new CD “Let’s Go Outside” is super fun, uplifting, happy, bright, positive, educational and something that every single person on this planet needs to hear. Joe is a genius when it comes to writing children’s songs. This album will make you dance, smile, laugh and go outside! He teaches the importance of nature and taking care of the environment for this and future generations in a very fun and easily understandable way. My 6-year old has learned so much just from listening to Joe’s music. It plants the seed that grows into wonderful discussions about very important issues. My 1-year old loves to dance to this CD especially the Turkey Vulture. And it’s not just for kids! I listen to it when I am alone simply because it makes me so happy. I have been buying copies to share with friends and family near and far. We love Joe, his music and seeing him play live any time that we have the opportunity. This CD is VERY much worth purchasing!! !